Whether it’s a formative or summative assessment, the multiple-choice exam has proven itself to be an efficient and effective tool for assessing content knowledge in a variety of settings. The building blocks of those exams, the items themselves, should be well constructed with the assessment blueprint in mind to ensure proper alignment with your educational goals and to maintain standards for reliability and validity. Unfortunately, being successful at multiple-choice question writing takes practice, but you don’t have to go it alone. Follow these general guidelines to get started creating valid exam items. Strong multiple-choice items begin with a clear, concise question requiring exam takers to apply knowledge to a novel situation. If you’re testing clinical skills, present a patient vignette and ask the examinee to identify what the healthcare provider should do next. A question for a research course might include a description of an experiment design followed by a question that requires students to determine the best statistical test to run or to identify potential ethical pitfalls. When writing the item stem, consider an appropriate level of difficulty. What a second-year medical student is expected to know about a disease process is likely very different from what a resident training in a specialty is expected to know. A freshman student enrolled in a general biology course would not be expected to perform the same way an advanced chemistry major would be on a test of basic science concepts – your item wording should reflect an appropriate level of difficulty. It’s tempting to think about designing a multiple-choice item to travel the distance, but it’s best to focus on one concept per item. Imagine a scenario in which a student must know both the pathology and the pharmaceutical treatment associated with a medical condition to respond to an item correctly. If examinees struggle to respond correctly, how will you know which of the two concepts tripped them up? Make sure each item assesses knowledge of a singular topic or objective. When creating the answer choices for questions, start by writing the correct answer. Make sure that the intended correct response is the only correct response available for students to select. Next, write a distractor that is similar to the correct answer—this is the distractor you want students to weigh alongside the intended correct answer and the option that will separate students who have mastered the content from those who have not. Finally, draft two or three additional options that are reasonable responses to the question. All remaining options should be similar in length, structure, and format. Don’t waste the examinee’s time with silly options—it’s better to have three plausible options than to include a fourth nonsensical distractor. At some point, every educator makes common mistakes when writing multiple-choice questions. Make sure you are creating question that do not assess students on trivial facts—these illustrate only that they are able to memorize facts and figures. Avoid “all of the above,” “none of the above,” and variations on “a and b, but not c” in your answer options. Students are savvy to them, and options of this nature make it much more difficult to determine what students do and do not know regarding a topic. Make sure to phrase the stem positively. It’s quite the shift in mind-set for the examinee who is moving along nicely looking for the best answer to suddenly have to look for the false or incorrect response. Plus, this question type assesses only what NOT true about a given topic. Test your items on an individual who is not as familiar with your subject matter as you are. 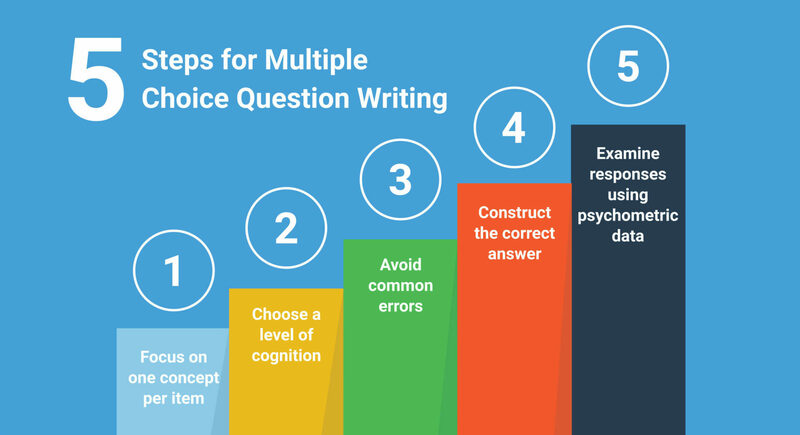 Someone who is less familiar with the topic might be able to provide you valuable insight about how to make your multiple-choice question clearer than it already is. Use a multiple-choice test maker and reporting tool to analyze your item performance and make revisions as necessary. Psychometrics are an invaluable piece of the puzzle to understanding how your questions are performing within your assessments. "Sarah B. McBrien, Ph.D., is assistant professor and Director of Curricular and Learning Assessment for the College of Allied Health Professions at the University of Nebraska Medical Center. Dr. McBrien oversees the assessment and evaluation in the College, conducts research related to educational measurement, and enjoys using educational technology to gather valuable data for the enrichment of teaching and learning."